2v2 and 3v3 Ladder table going out of their background box for me. I always have all sounds and music turned off, but sometimes in the first game where I take my turn after starting up unity, I still get some sounds. I'm using google chrome. Is this a bug? I can't find exact boot times anywhere. This is annoying because I have no idea how long I have to wait for a teammate before being forced to lock something in. Hover your mouse over the clock/click on it. NOTE: I am not asking about where it says "2 days, 23 hours." 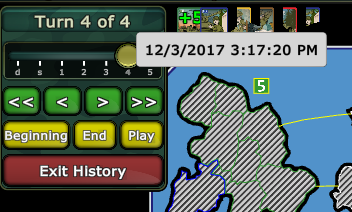 I am asking about the exact day hour:minute:second is located for the last turn's move. You are right, IDK if there is a way to see the excat time until boot for MD games. I guess you would kinda expect to find it here : https://gyazo.com/a705213bfa06a526e9e9a60b7a8abd71 with a sentence sort of like "This player can be booted in x days, x hours, x minutes.. Not sure if you need seconds there. The main MP screen do say "waiting for player x for x days x minutes. But it would be nice to have it inside a game too. If I am right, Smoove is asking for a equivalent of flash showing the turn's exact time of progression in history. Once it gets past 1 day, it doesn't say minutes. Before, when I would look at history, it would show the exact time the turn advanced, which was great because then no one ever had to guess when turns would advance. The Master Mania map behaves differently on Flash and Unity. If I click on the icons in the legend, it highlights all bonuses of that kind in Flash(but doesn't on Unity). Is this something that should be fixed by the mapmaker, is it a scenario not supported anymore, or is it a bug? Long playernames without spaces get cut off on their profile page. I'm not sure how to make it perfect. If we do "word-break: break-all" then people complain about words not wrapping. If we do "word-wrap: break-word" then names without spaces push the page out. If we do "overflow-x: truncate" then spacing looks good but people complain about long names getting cut off. The next update will allow map padding to be configured in the debug menu. This is just the first step towards a fix. If we can find a better padding value it can be adopted as a default, if not we can continue experimenting to find a better solution. Did we lose the feature of setting a separate time for when a player could be booted by a player and when a player would be auto-booted? Yes, in practice setting them to different values doesn't work well since sometimes you'll have a player in the game who will click the direct boot button as soon as it becomes available, and sometimes you don't. This just makes it inconsistent and a bad experience for everyone involved. I haven't heard of this before. What sounds do you hear? Deploying/attacking/turn advance/music/etc? Approximately how long do they persist? It looks like the map does something really weird with bonus links. It might be exploiting some bug in Flash to make it clickable, so it's expected that it wouldn't work on any other platforms. I have had this a few times as well. 0,5 seconds of wz sound even though its supposed to be disabled. edit: has there been any change, unity is going crazy for my cpu again, fps is already down to 15.